One of the more intriguing scenes of an overall horrid 2017 season came in Lexington, Kentucky. Austin MacGuiness had come up just short on a potential game winning 57 yard field goal. 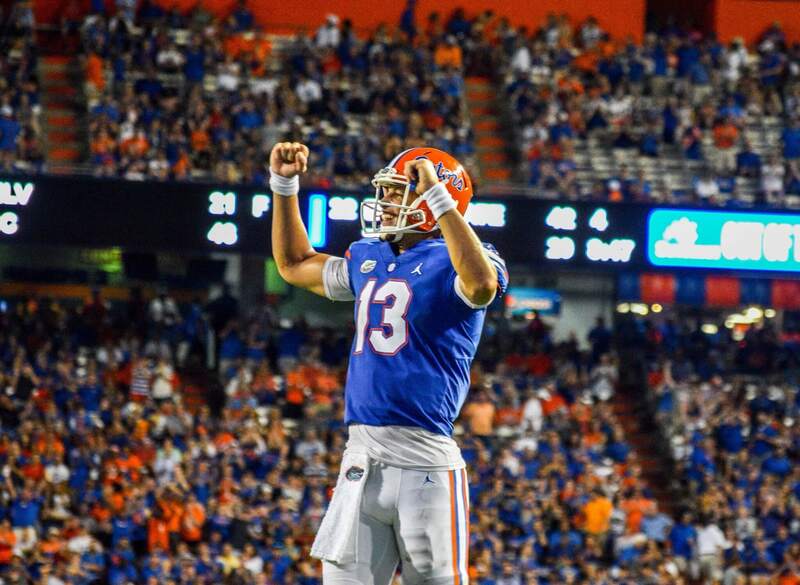 Marco Wilson was bounding around, holding up three fingers on one hand and one on the other to signify the Gators’ extension of the nation’s longest active winning streak over another opponent to 31. Jim McElwain looked rather dazed and confused, with the lighting from the stadium making his skin look white as snow. And somewhere in between them, Feleipe Franks was mockingly waving goodbye to the Kentucky fans who had been quite vocal all game. Franks, of course, had been benched on the third drive of the second half against the Wildcats after a dreadful start: take away the play where Kentucky couldn’t even be bothered to cover Tyrie Cleveland and gave Franks a free throw against air, and his stats were 6-11 for 40 yards in two and a half quarters of work. There was no impartial way to speak positively of his performance against the Wildcats. Yet there he was, waving bye-bye as if he had contributed. Of course, this is a new season, and one that Franks has begun with some real promise, so continuing to hold that against him at this juncture in time is both petty and overly pessimistic. But while it does no good to keep actively bringing it up, it’s also not something that’s wise to forget. Kentucky returns nine starters from that defense that Franks got benched against, and while the location has been moved to Gainesville, the fact remains that his last performance against these same players was awful. Cue the positivity that last week created. Dan Mullen is a better X’s and O’s coach than Jim McElwain. Mullen and Co. called a game that Franks was much more comfortable with than any game McElwain or Doug Nussmeier called. Conversely, Franks looked more comfortable against Charleston Southern than he did at any point last year, including against a UAB school that just restarted its football program. Franks has better receivers this year. Etc. And the sum of all of those positive feelings about Franks was that yes, we need to proceed with caution given the opposition, but he seems to have turned a corner. The opinions of Franks that last year’s Kentucky game- most of last year, really- and this year’s Charleston Southern game elicited are now headed for a collision course. One of those lines of analysis are going to be discarded after this Saturday night when Franks gets a second chance against the defense that he got benched against. And one way or another, we’ll more or less know what we have in him. You can forgive Wilson and Franks for doing that stuff after the game last year since they are young. More important is how our o-line run-blocks and picks up blitzes. That will determine the game, IMHO. Don’t forget that we should be in better physical condition this year.